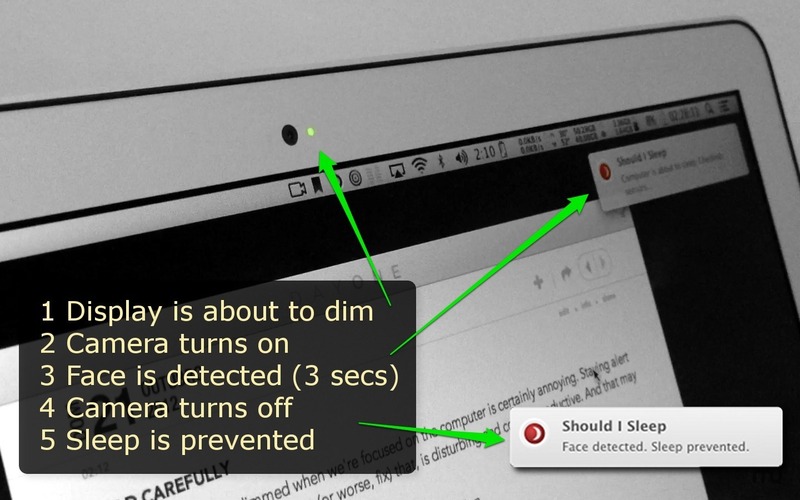 Prevent display sleep using face detection, timer, and more. Is there a better alternative to Should I Sleep? Is Should I Sleep really the best app in System category? Will Should I Sleep work good on macOS 10.13.4? Should I Sleep prevents display from sleeping with face detection, timer, and other sensors. Annoyed by the display getting dim when you're reading or watching something? Installed an app for that, but always forget to activate it? By using a combination of heuristic sensors, such as face detection, Should I Sleep checks if you are actually at the computer before it sleeps. Yes, the computer "sees and hears" you. When the display is about to dim, Should I Sleep will start its sensors. Camera, microphone all other software processing will stay on for only about 3 seconds. After that, sleep will be allowed or prevented. No need to touch any button. Face Detection is the most effective sensor and works by capturing video from the camera and looking for eyes, nose and mouth (all three are needed to make a face). If one or more faces are detected, sleep is prevented. Sleep is prevented if a moving target is captured by the camera (such as waving, walking, or even slightly moving your head). 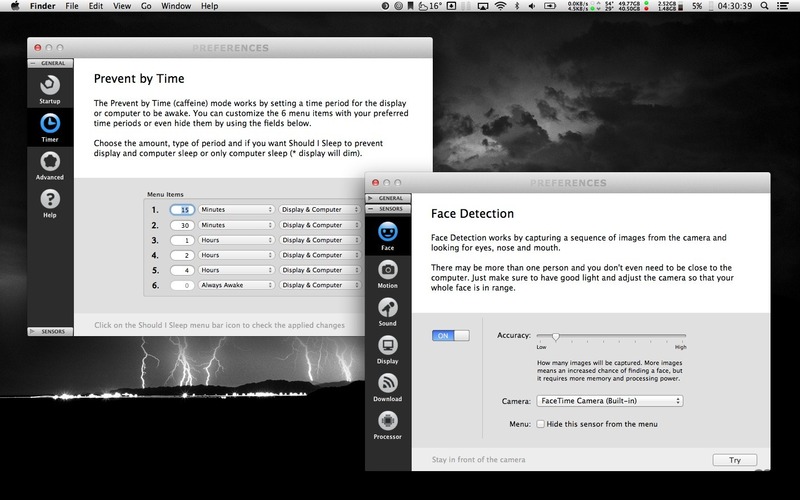 A perfect combination for the default face detection as it works even when you are not directly facing the camera. No more broken downloads! Prevent sleep if there is network traffic. It works with all apps, on operations such as downloads and uploads, enjoying online videos and music, and also receiving emails. And it even lets you keep downloads with the display dimmed! Prevent sleep if any app is performing CPU-intensive tasks, such as audio and video conversions, encodings, renderings, scientific calculations, image processing, etc. Prevent sleep if an external display is plugged-in. A must-have for those who give presentations, speeches, demonstrations and/or trainings. Prevent sleep If ambient sound is detected. Useful when you're talking near the computer such as in workshops and meetings where the camera may not be in a favorable position. On the preferences screen you'll be able to adjust sensors sensitivity so that Should I Sleep can work more effectively in unusual environments. Should I Sleep was developed with a modular, extensible approach. We believe that the best sleep prevention is done by analyzing as many environmental elements as possible and we'll be adding more sensors in the near future. We have also added the old-style timed sleep prevention (caffeine mode). You just choose a predefined time period for the computer to be kept awake. Time periods and menu items are customizable. 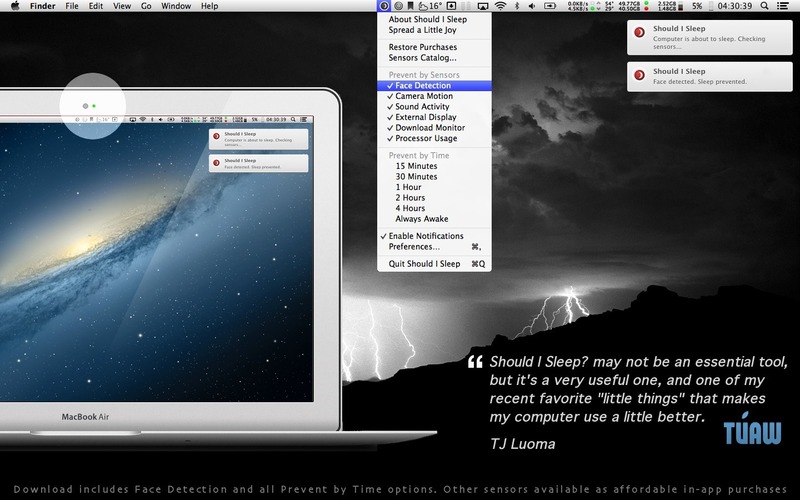 Should I Sleep is available for download from the Mac App Store. It includes the face-detection sensor and manual-timer mode. Additional sensors can be purchased for an affordable price from within the application menu.